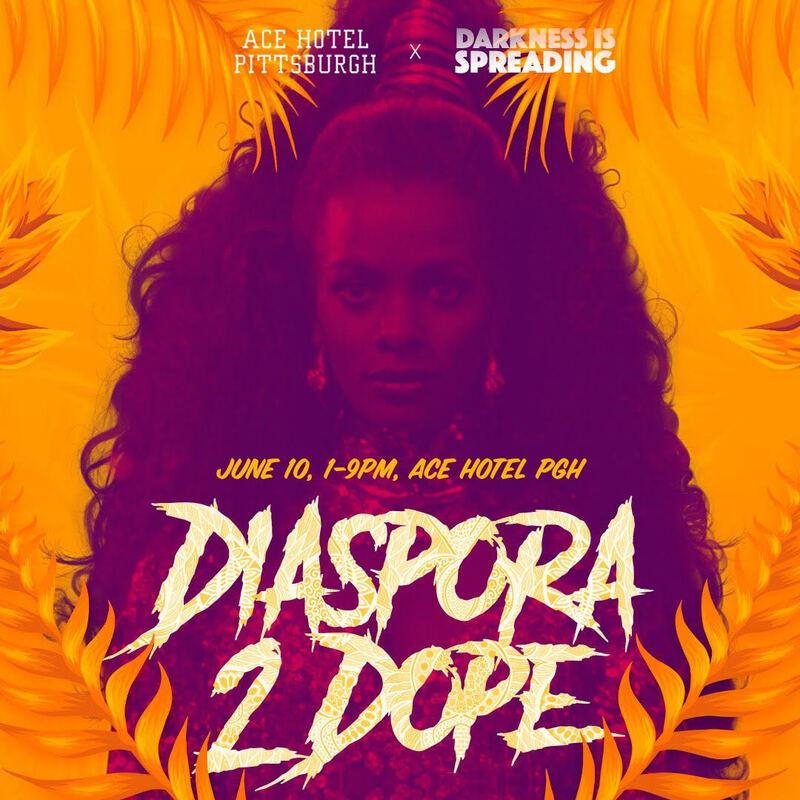 Darkness is Spreading presents DIASPORA 2 DOPE, a block party and dance jam celebrating the summer season, pride weekend, and dope music from the global Black diaspora. Their previous turn-ups: Halloween 2017 and Feb 2018’s The Afrofuture is Now; if you were at one or both of those parties then you know how they do…and if you missed out it’s time to get familiar. Music: A trip around the world — Hip-hop, R&B, dancehall, reggae, afrobeat/s, afropop, soca, house, trap, go-go, and more. 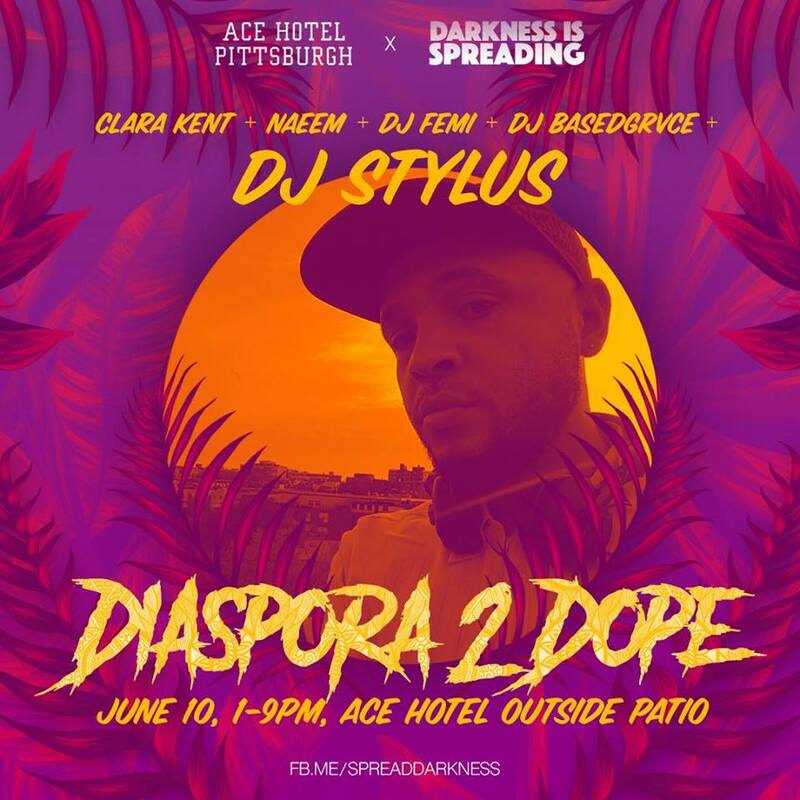 Pittsburgh’s own DJ BASEDGRVCE, Naeem (DETOUR, Hot Mass) & DJ FEMI will be starting things off right in the daytime. Evening time will cap off with a performance by the gorgeous and talented Clara Kent fresh off her show at SXSW. AND THENNNN, from 6:30pm until we shut it on down, our special headlining guest from Washington DC, DJ Stylus – The Vibe Conductor (Axel F), will be ready to make the evening revelers lose their minds. WHERE: Ace Hotel’s patio, right outside the hotel next to the library. WHY: To provide a safe, diverse, and dope atmosphere where you can sip on a lil somethin courtesy of Ace Hotel’s Whitfield restaurant and bar, flirt, commune, brown your legs in the sun, and shake your donk all day long. Come alone or bring your crew; we’re committed to fostering a friendly, joyous crowd no matter who you roll with. DRESS CODE: Do you. Ballcaps & kicks, sundresses, daisy dukes, hijabs, abayas, fishnets, cosplay, long kanekalon ponytails, bougie brunch ‘fit, short sets, etc etc etc. Rep your culture, the diaspora, and/or your personality however you see fit. Note: All Darkness is Spreading events are INCLUSIVE. No racism, no transphobia, no sexism, no anti-semitism, no Islamophobia, no homophobia, no body shaming. This is a free zone, word to Janet Jackson.